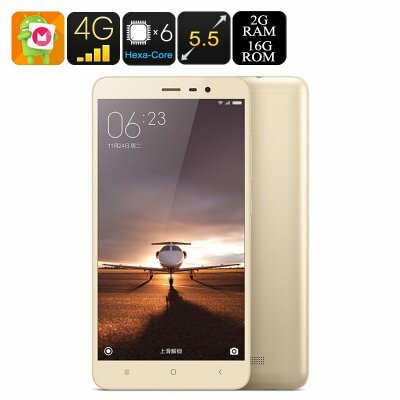 Successfully Added Xiaomi Redmi Note 3 Pro - Dual-Band Wi-Fi, Snapdragon 650 CPU, Adreno 510 GPU, Dual-SIM, 4G, 2GB RAM, 16MP Camera (Gold) to your Shopping Cart. Get ready to enjoy all your mobile games, apps and media files in mesmerizing speeds and quality like never experienced before. Featuring the Qualcomm Snapdragon 650 CPU the Xiaomi Redmi Note 3 Pro is among the first smartphones out there to hold hardware so powerful it can handle all the latest and most demanding Apps without dropping a single frame. Holding a beautiful and large 5.5 inch FHD display this Chinese smartphone offers a perfect platform to enjoy all your favorite media files in stunning 1080 resolution. Besides its ultra-fast Hexa-Core CPU that has clocked at 1.8GHz, this Android phone is equipped with an Adreno 510 GPU and 2GB of RAM. With all this powerful hardware packed into a small and beautifully designed device the Xiaomi Redmi Note 3 Pro is capable of meeting the most demanding needs of smartphone users out there. With its 4G connectivity and dual-band Wi-Fi this Android phone offers the fastest data connectivity currently available on the mobile market. No more slow internet connection nor slow data transfers, with the Xiaomi Redmi Note 3 Pro you will be able to download files in the blink of an eye and stream FHD movies smoothly without any lag or interruption. Backing up this powerful hardware is a massive 4000mAh battery that provides you with hours of continuous usage time. No longer will there be the need to worry about running out of juice as, no matter for what purpose you are using the Xiaomi Redmi Note 3 Pro, with this battery you are sure to get through the day without the need to recharge. The Xiaomi Redmi Note 3 Pro comes with a 12 months warranty, brought to you by the leader in android phones as well as wholesale electronic gadgets..